Part science, part mysticism but all comfort and beauty. 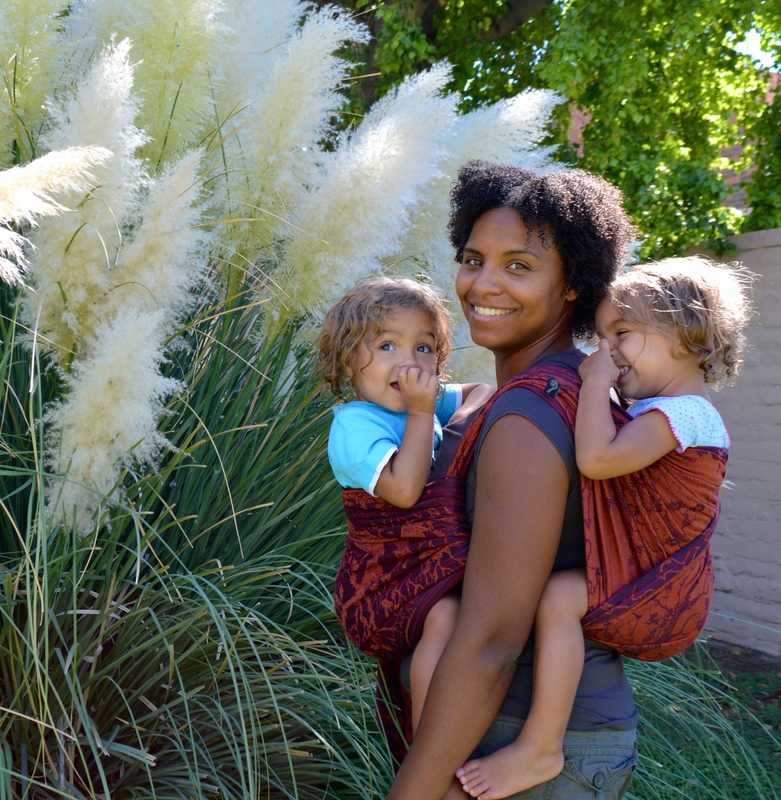 This is the babywearing world according to Firespiral Slings. 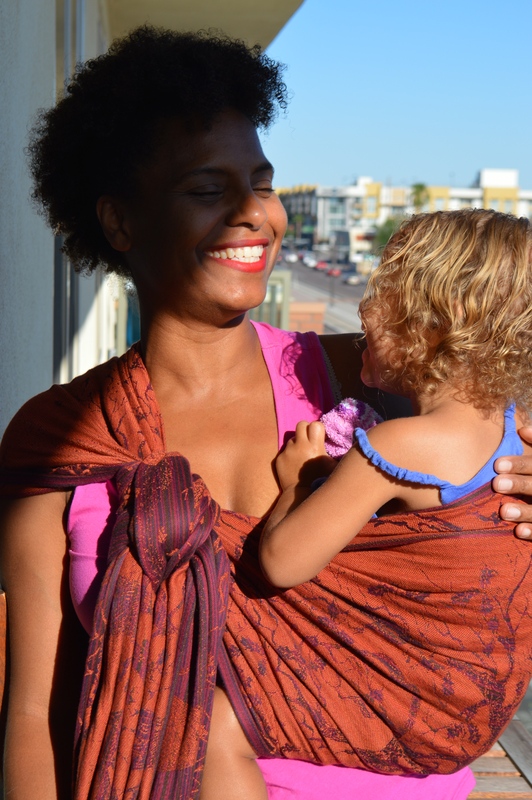 Based in northwest England, Firespiral Slings is the passion of two avid babywearers who dreamed of owning their own babywearing brand. The wraps are woven in England with a focus on sourcing local fibers, local weavers, and ecologically sound materials. This is just the tip of the principles employed at Firespiral Slings. Their designs are reminiscent of nature itself. Previous releases featured sprays of ocean against rocky shoals, fractals of leaves, and trees throughout the year. I always find beauty as well as thoughtful design in Firespiral Slings and am equally impressed that all the design is done by Tamsin and Jen. 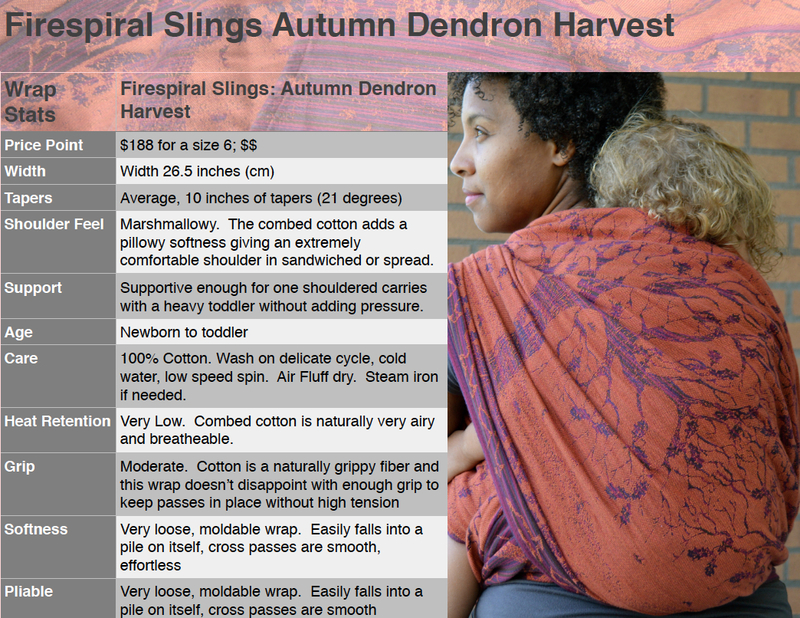 Autumn Dendron Harvest is a stunning 100% combed cotton wrap arriving soft, fluffy, and supple. The wrap is aptly named featuring three mellifluous colors of fall; deep merlot, burnt orange, and crimson balanced with warm chocolate threads. Branching trees with leaves actively falling form a picture of the change of seasons. Our favorite detail was of course the bushy tailed squirrels running along the top and bottom rails in contrasting colors of merlot and burnt orange. The opposite side is the mirror image with the dominant color burnt orange in contrast to the right side dominant deep purple. The dendrite is the branching body of the nerve cell, reaching out from the main body of the neuron just as the tree branch reaches outward away from the trunk in search of sunlight for nutrients. The scientist LaKeta is very pleased to see such allegory between the natural world and the human body. 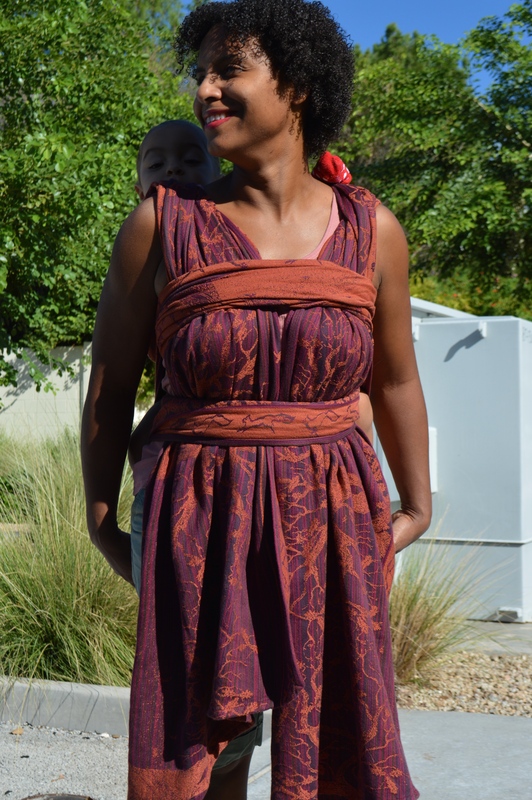 With such beautiful contrast in and so much to be seen in one wrap, we set to work to really test and enjoy the wrap by participating in the FiSpi 30 day wrap challenge. A wrap that arrives here must be ready to work. There is no room for a delicate wrap that requires more time and attention than we get wear. Autumn Dendron arrived so soft and fluffy I was initially concerned that the wrap would be prone to pulls and too fragile to be supportive. Definitely not the case with Autumn Dendron. Making our way through the first 20 carries in the challenge, we never encountered any pulls or even one moment when the wrap didn’t perform. 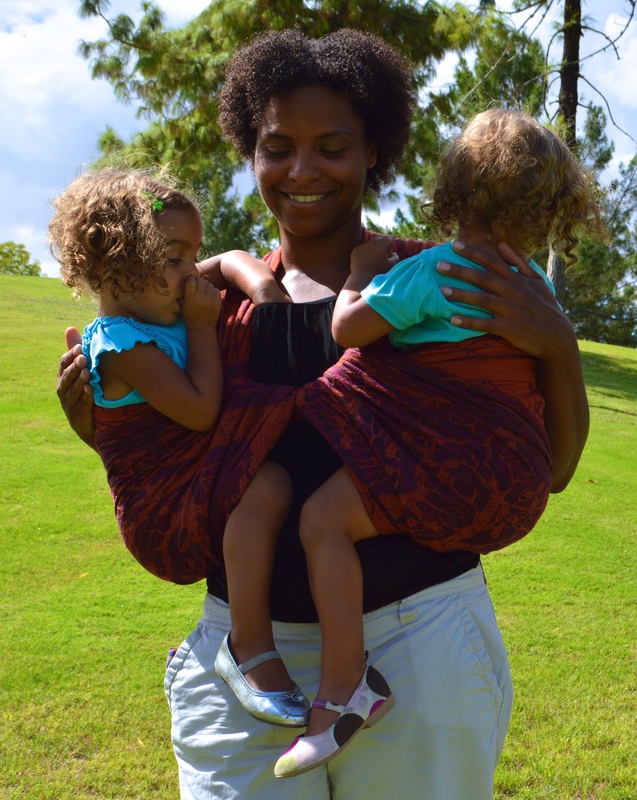 I found the wrap supportive enough for wrapping two toddlers and so soft on the shoulders it was definitely meant for long wear. 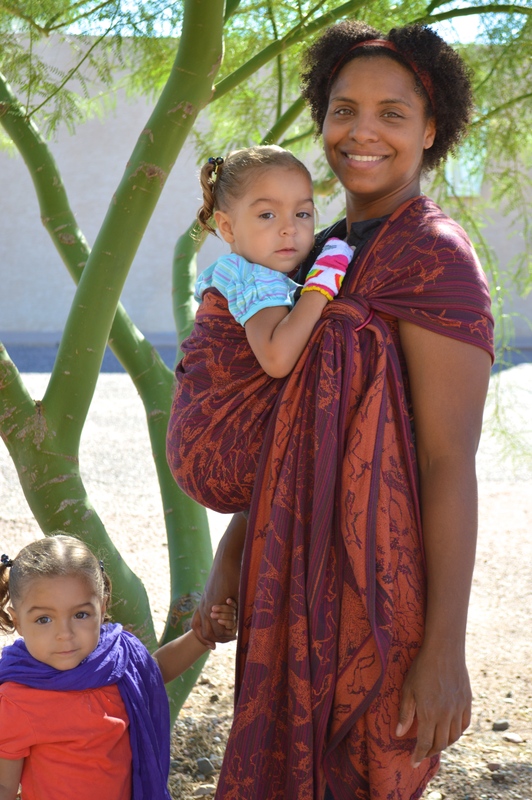 The wrap challenge helped us along in our testing, a challenging list of increasingly difficult carries including front and back torso carries. We found the slipknots to hold perfectly, back carries to be high and supportive without any sagging, and even those dreaded one shouldered hip carries were comfortable with marshmallowy shoulders. Combing cotton is a mechanical process by which impurities left behind from the boll and burr are removed and shorter fibers are also removed. The longer the cotton fiber, the softer the resulting fabric. The combed cotton is twenty-one fibers spun together with a longer length of extra long staple cotton. This yields a stronger yarn with superior softness. For comparison let’s take the standard yarn used for handwoven babywearing wraps. The handwoven yarn is usually 16 total fibers of spun cotton and is known for infant blanket softness. The combed cotton used in many of the Firespiral wraps would be 21 total fibers per strand of yarn and as it is unmercerized would retain the fluffy texture we come to expect in cotton. This means a wrap that is just as soft as a handwoven yet stronger, with a higher thread count. Autumn Dendron is well balanced in glide and grip. I found there to be more grip than glide as passes retained placement and position without the need for readjusting or overtightening. This is great news for those who have difficulty getting those passes high enough over your baby’s back. A simple elbow flex on the side and the pass glides up and stays in place allowing you to continue to tightening without worrying the pass will slide down baby’s back. The grip was significant enough that we wore the Kelly’s Frankencarry both with and without the rings with nice tight chest and waist passes. The Front Torso Carry is not a complicated carry to wear but does take skill in perfecting getting those cross passes just right across the back without the shoulders to help keep them in place. I loved that Autumn Dendron had enough grip that those cross passes stayed high across my back and didn’t slip. 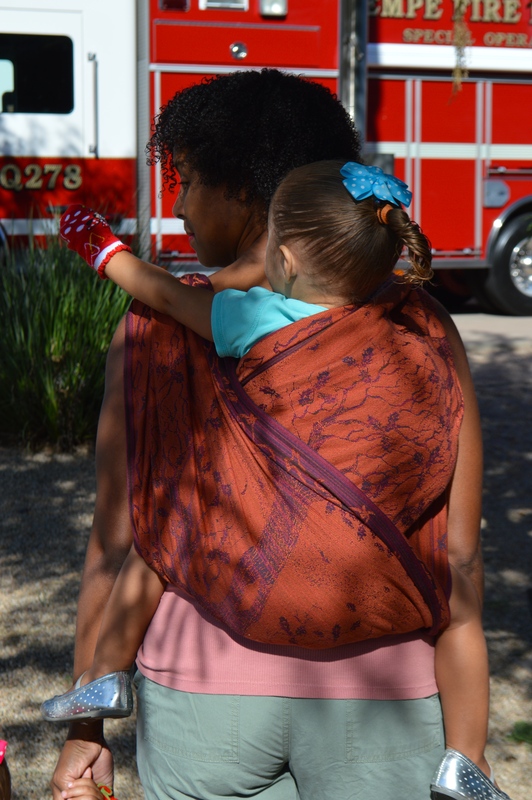 The Poppin’s Hip Carry was equally comfortable and supportive in the one shoulder without sagging or constant readjustment. The colors in the reverse side of the wrap made for so much more beauty too with the pleats and spread pass of the Poppins Hip Carry. I enjoy wearing my shoulders spread, it is usually too much pressure in sandwiched shoulders for my comfort. The shoulders in the combed cotton of Autumn Dendron were pillowy, so soft it felt like padded shoulders. This made single layer back carries with ruck straps extremely comfortable and multilayered back carries supportive allowing excellent weight distribution as well as being nice and easy on the shoulders. The twins are now about 28 pounds (11.8kg) each. We usually prefer front and back tandem carries where their weight is balanced and I still have full range of motion in my arms. We occasionally still wear our tandem hip carries when we need that extra reassurance or comfort. Amanda’s tandem hip carry was a breeze in Autumn Dendron and as the tandem version of Poppin’s Hip Carry the amazing contrast of the wrap was perfect when reinforced with passes spread. Overall I believe even if Autumn Dendron is your first FiSpi or sixth you will be well impressed with the wrapping qualities. I have always been a fan of the artistry in the designs, found comfort in their previous releases in the Alchemy range, and have been so excited to stalk for a next release. Ramasamy, K. A., G. Nalankilli, and O. L. Shanmugasundaram. “Properties of cotton, tencel and cotton/tencel blended ring-spun yarns.” Indian Journal of Fibre & Textile Research (IJFTR) 39.3 (2014): 322-325. Ying, Guo, et al. “Investigation and evaluation on fine Upland cotton blend yarns made by the modified ring spinning system.” Textile Research Journal 85.13 (2015): 1355-1366. Mishuk, Aminul Islam, et al. “CARDED AND COMBED YARN EFFECT ON FINISHED FABRIC QUALITY.” European Scientific Journal, ESJ 11.27 (2015). Rashid, Md Rafiqur, Farid Ahmed, and Abul Kalam Azad. “An Investigation about Abrasion Resistance and Seam Stretchability Properties of Weft Knitted Fabrics made from Conventional Ring and Compact Spun Yarn.” International Journal of Scientific and Research Publications (2012): 154.